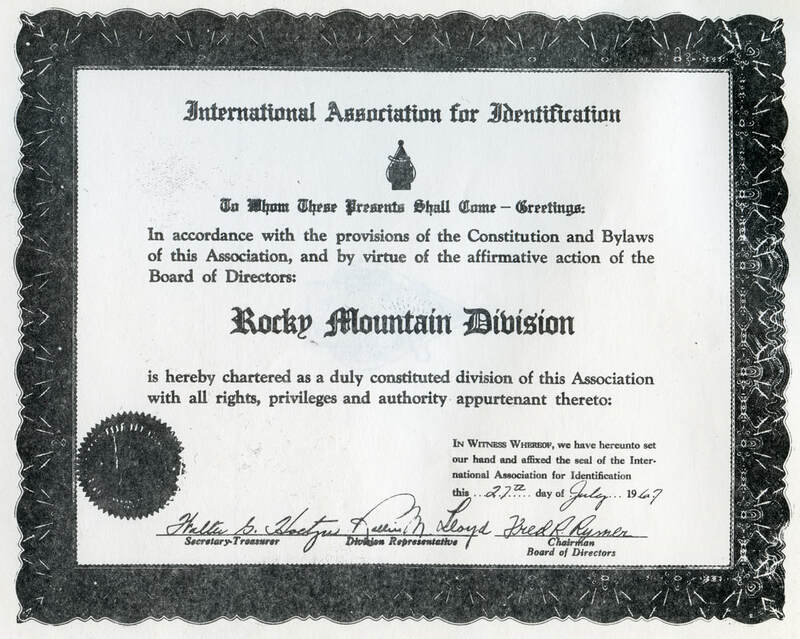 The Rocky Mountain Division of the International Association of Identification was conceived in the minds of fourteen members of the International body living in the Colorado-Wyoming area who decided to charter a division in their area. The Rocky Mountain Division was formulated in 1966. Realization came on January 26, 1967, when all known identification officers in the Colorado-Wyoming area were invited to a seminar in Greeley, Colorado. It was at this meeting that the Rocky Mountain Division was formed. 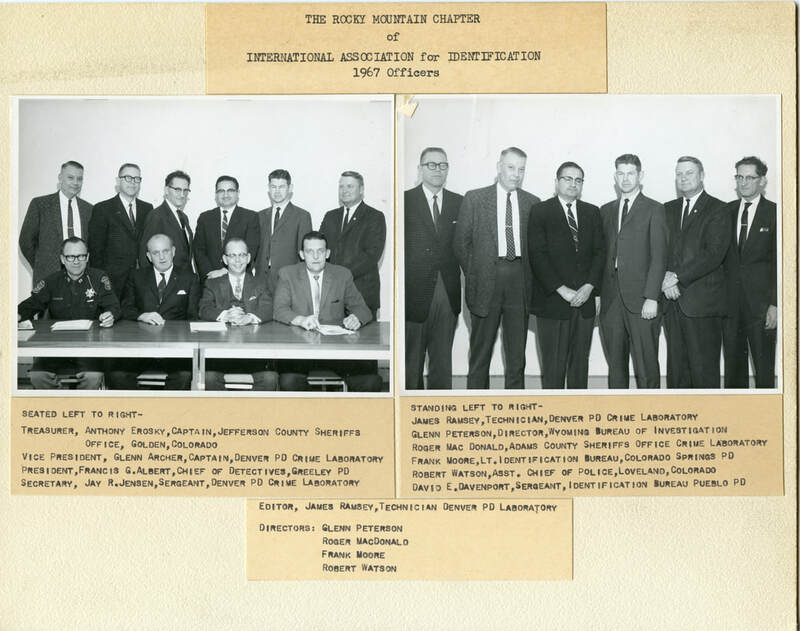 Pictured above is the Rocky Mountain Division Chapter of the International Association for Identification charter, July 27, 1967. It reads: "To Whom these presents shall come - Greetings: In accordance with the provisions of the Constitution and Bylaws of this Association, and by virtue of the affirmative action of the Board of Directors: Rocky Mountain Division is hereby chartered as a duly constituted division of this Association with all rights, privileges and authority appurtenant thereto: In Witness Whereof, we have hereunto set our hand and affixed the seal of the International Association for Identification this 27th day of July 1967." The officers were elected, guidelines were set, and conference plans were finalized. It was their intent to bring together professionals involved in police identification through educational conferences and training seminars. This was expanded to include a bimonthly newsletter publishing informative articles on old and new scientific identification techniques, as well as other articles on the related fields to enhance the expand the knowledge of the professional law enforcement and scientific identification community. 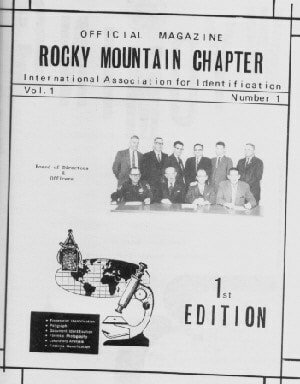 Pictured at left is the cover photo for first Rocky Mountain Chapter of the International Association for Identification Official Magazine, Volume 1 Number 1. Officers shown on the cover are the newly elected officers. From left to right, seated is Capt. Erosky, Capt. Archer, Lt. Albert, and Sgt. Jensen. Standing is Dir. G. Peterson, Tech. Ramsey, Sgt. Davenport, Off. McDonald, Lt. Moore, and Asst Chief Watson. Photo by Tech. W. B. Smith, DPD Photo Laboratory. "On the cover, for the first time, is the emblem officially adopted by the officers of the Rocky Mountain Chapter. The art work surrounding the Official International Association for Identification emblem, creates for us an emblem that is significant for both Colorado and Wyoming. The evergreen and Aspen trees in the foreground, backed by the beautiful, snow covered mountains, is the work of Police Technician/Artist, Dex Landau of the Denver Police Departments Identification Bureau. Dex has done beautiful art work for the Denver Museum of Natural History, the cover of numerous Colorado Wildlife Magazines published by the Colorado State Game and Fish Department, art plates for several books of wild life study, and for many private individuals." Of course, the newsletter has evolved over the years, and is now a quarterly publication called The Silent Witness, distributed primarily via email, and published on the RMDIAI website. The RMDIAI sponsors educational conferences, typically in the fall of each year, and in the spring when feasible. These conferences cover subjects such as the collection and preservation of evidence, crime scene photography, bite mark evidence, latent fingerprint techniques, major crime scene investigation, and many more interesting and informative topics. These subjects and others are repeated from time to time to not only inform new members, but to refresh the veterans. The subjects are also updated including new techniques and other topics that have never been covered before. Lasting friendships and important contacts are made at these conferences with people who are experts in their fields and who are ready and willing to assist you any time you need it. We enjoy ourselves and have a lot of fun, but we take our work seriously and stress solid professional education. 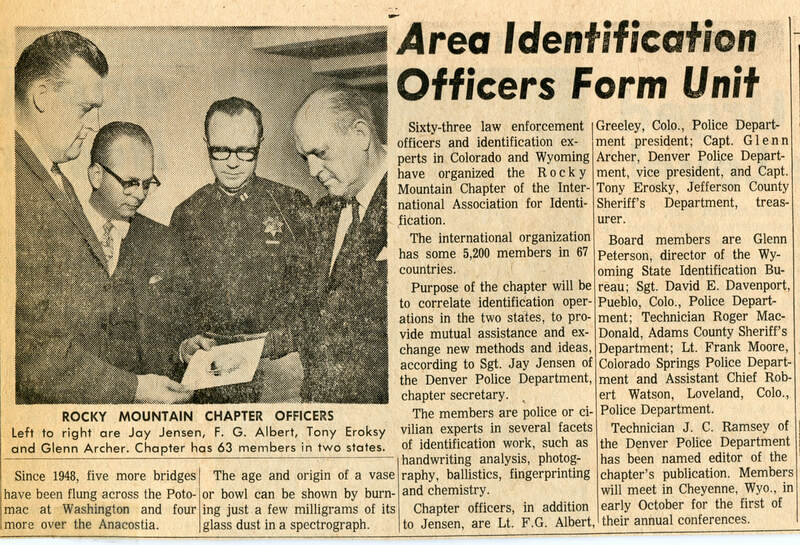 From Volume 1 Number 3: "Conference News: The first annual conference of the Rocky Mountain Chapter of the IAI will be held Oct. 12-13, 1967 at the Hitching Post Inn, Cheyenne, Wyoming. The registration fee is $6.50 per person! This includes a full Conference program for the members, a special program for the wives, a cocktail hour on the eve of Oct. 12, just prior to our banquet smorgasbord with live background music for your relaxation." Volume 1 Number 4: The First Conference: "Having called the 1st Annual Conference of the Rocky Mountain Chapter of the International Association for Identification to order, Rev. Harvey W. Cutting offered invocation. Chapter President F. Albert of the Greeley Police Department introduced the Mayor of Cheyenne Wyoming, The Hon. Herb Kingham, and the Chief of Police of Cheyenne Wyoming, Chief James Byrd, who both welcomed the Rocky Mountain Chapter to Cheyenne with brief speeches offering their full cooperation in an effort to make our conference a success. Thyra Thomson, Wyoming Secretary of State was then introduced. She expressed her happiness that Cheyenne was selected for our 1st Annual Conference. She then spoke, expounding upon the value of the Social Security number as an important part of establishing identification along with the positive identification offered by fingerprints. She has found this to be of value in connection with clearances of applicants for securities license. Thru the efforts of Glen Peterson, Director of Wyoming State Bureau of Identification, the Social Security number is also used on both drivers license and fishing/hunting license as an additional means of identification."